The Peninsula Iron Works team received our new Messer Oxy-Fuel & HD Plasma machine this morning. This machine will allow us to HD Plasma cut up to 3.5” thick and will still allow us to burn 12” plate using the oxy-fuel system. Our effective cutting size will be 96” x 120”. With the new true hole technology from Hypertherm we will virtually eliminate hole taper in plate 1” and under using the HD plasma. This machine will be a welcome addition to our capacity and we look forward to having it installed in running over the next few weeks. Peninsula Iron Works as always been known for it's large machining and industrial capacities, but that isn't the whole story. We are well versed in fabricating stainless steels, titanium, nickel alloys, inconel, and other exotics. We don't consider ourselves just a machining and fabrication company, we are a solutions provider. Give us a call on your next project and let us be your solution. Peninsula Iron Works has been in business for 101 years as of this year. Being in business this long means we have served a huge variety of industries and customers. And with each different industry and customer you learn to solve different types of problems. 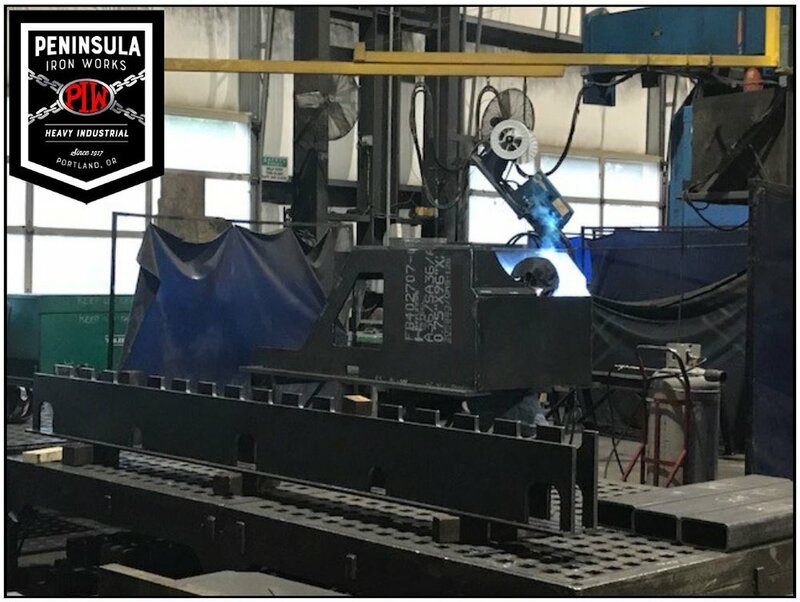 When you partner with Peninsula Iron Works you can rest assured that our talented team of people will constantly be on the lookout for ways to improve the efficiency, price point, or durability of your product. A great example is the part shown below. We designed a removable liner system that will allow the customer to get more life out of their components between rebuilds. In the long run that decision doesn't benefit us as we were the team doing the rebuild, but it helps our customer and that is what we are all about. Come to us with a problem, we might just be able to help. Peninsula Iron Works is a 101 year old machine shop, but what many people don't know is that we have an extremely talented fabrication group as well. Our team of fabricators are some of the best around. Our strength comes from the diversity of work that we perform. From your basic mild steel to the more exotic items such as titanium and super duplex we can help. Do you have a unique or difficult fabrication project you are looking for partner on? Call Peninsula Iron Works and let us know how we can assist you! Do you remember the brain teaser picto-puzzles that were printed on the inside of beer bottle caps? I have fond memories of collecting the caps from my grandfathers 'BeerBeer' bottles and then we would sit on the floor and try to decode the puzzles. Life is one big puzzle and if you solve problems for a living you get used to 'thinking outside the box'. The manufacturer of these tool extensions doesn't recommend you do this. The machine tool maker never envisioned anyone would try it. The customer had no idea how this could be done. With a little creativity, a lot of patience and years of experience you find that most everything is possible. We had to run this slowly and couldn't take much material but there weren't a lot of options to create the radii needed that close to a vertical wall. Horizontal was not an option since the demand was for a crisp step at the edge of this surface. If you have a project with unusual demands and challenges that have you stumped then give us a call! You would be amazed at what we can come up with to solve your problem. At the end of the day we aren't fabricators or welders or machinists or mechanics, we are problem solvers! Just like when we were kids and we sat around on the floor at grandma and grandpa's house solving puzzles on beer caps, we sit or stand at desks now and solve problems for our customers all day long! Send us your puzzle, we can solve it too. Peninsula Iron Works presented Linh Mai with his 40 year work anniversary gift today. Linh is an extremely talented machinist and an even better man. We are so grateful to have had him on our team for the last 40 years. Congratulations Linh on a great accomplishment! Peninsula Iron Works is a looking for a journeyman level fabricator/fitter with the below experience. Offering very competitive wages, vacation, and benefits. - Min. 5 years experience in heavy fabrication. - Ability to read blue prints and perform full fit up of complex weldments without assistance. - Mechanical experience a plus. - Must have the ability to take on projects from start to finish including managing your team members throughout. - Experience with exotic metals such as super duplex, Nickel, Inconels preferred. Please contact Blake Westling at Blake@peniron.com or 503-286-4461 if interested. When you are down, we are up! Peninsula Iron Works is always ready to step up to the plate and support our partners in any industry when they have an unscheduled down. We completed this 316 stainless weldment including material processing, fabrication, and machining in 3 weeks. Here at Peninsula Iron Works; when you call, we answer!